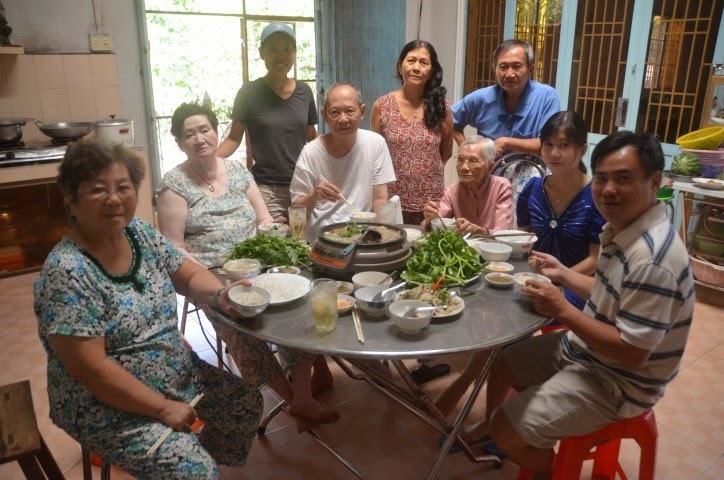 My maternal eldest aunt and her husband (known to me as Tua Y and Tua Tia in Teochew) came to Vietnam to visit for 2 months from Minnesota. This is Tua Tia's first visit since he left in 1995. 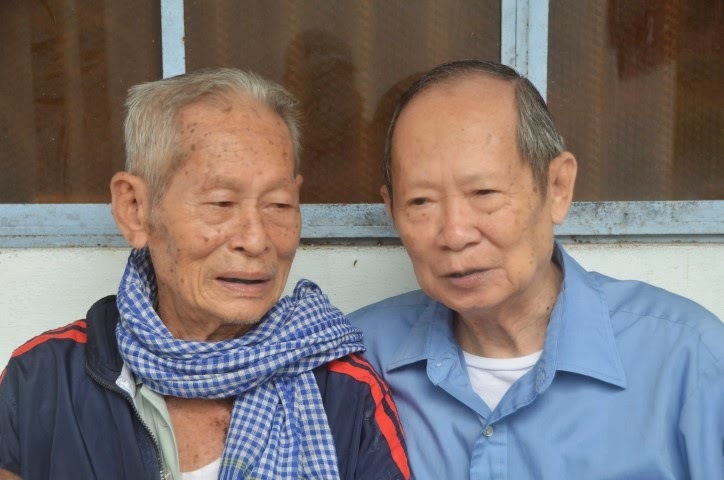 He has only two requests from me; 1) take a photo of him and his former colleague whom he has not seen in 40 years, and 2) cook him duck with fermented tofu hot pot or vịt nấu chao in Vietnamese. This dish does not sound so exciting but it is quite tasty. It is one of the favorite hot pots in our family. My mother often made this for us growing up. She uses water since we did not have access to fresh coconut water in middle of nowhere Maine. Tua Y uses coconut soda in Minnesota. I know back in Massachusetts coconut water has become a very popular drink and is readily available in many convenience stores or groceries. I used water from 3 young coconuts for this recipe. This batch of coconuts seemed to be sweeter so I did not have to add much sugar to this dish. 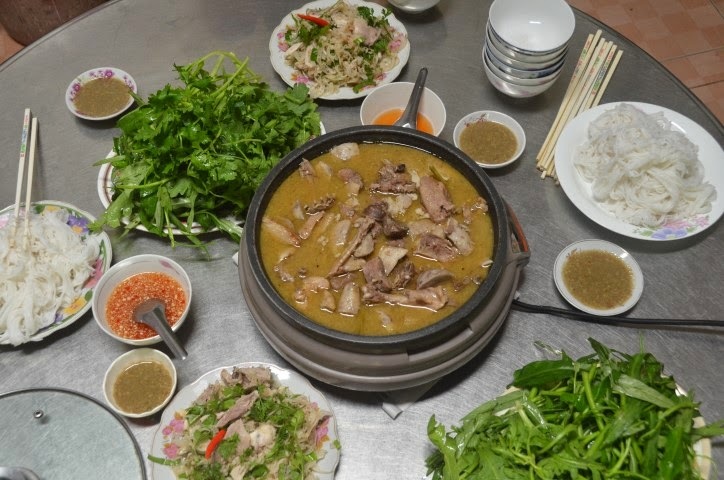 Although I put in a whole duck most of us prefer to eat with lots of vegetables such as Chinese celery, water spinach (rau muong), chrysanthemum leaves and rice paddy herbs. We also ate this with fresh round rice noodles known as bun in Vietnamese. Everyone seemed to like this dish including Tua Y who is very difficult to please when it comes to food. If she ate the food then it must be somewhat good enough for me to share on my blog! My uncle shares with my cousins and me his former colleague's generosity. 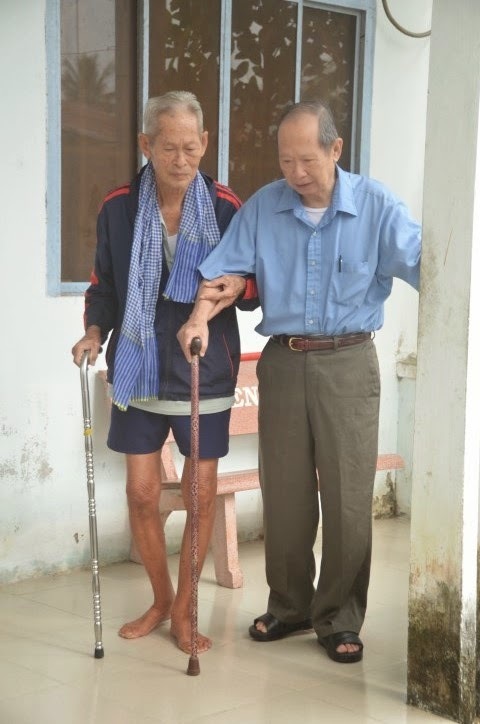 Both were stationed in the central highland (Vietnam) and after the war he had to return home except he had no money. 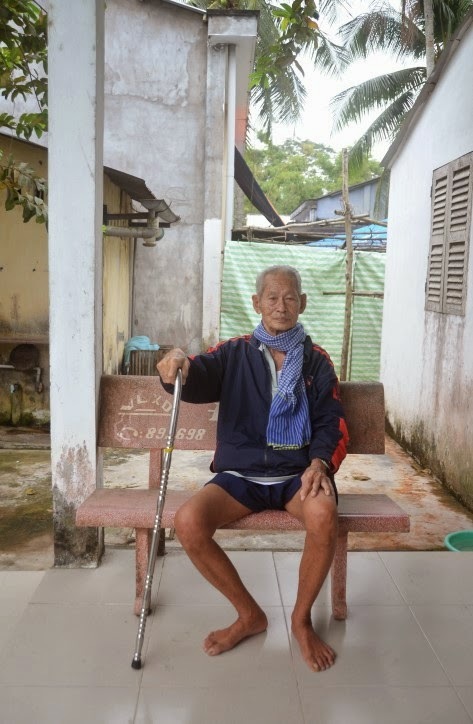 This man gave him 30,000 dong which back then was a lot of money. He remember his friend's kindness to this day and when he found out his friend currently resides not far away he paid him a visit to properly thank him. Tua Tia and Di Tia (2nd uncle by marriage) and I took a taxi through a cow pasture (which is also used as a soccer field) and stopped at the edge of it since we could drive any further. One of Tua Tia's relatives took him by a scooter and Di Tia and I left on foot to his colleague's home. 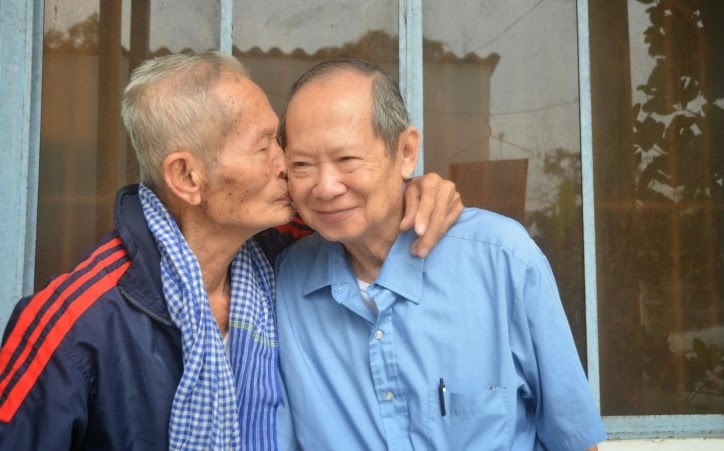 Both were very happy to see each other after all these years. His colleague told him that seeing him was enough and that was the best gift he can have. I was glad that I was present to capture part of this short but very special occasion. 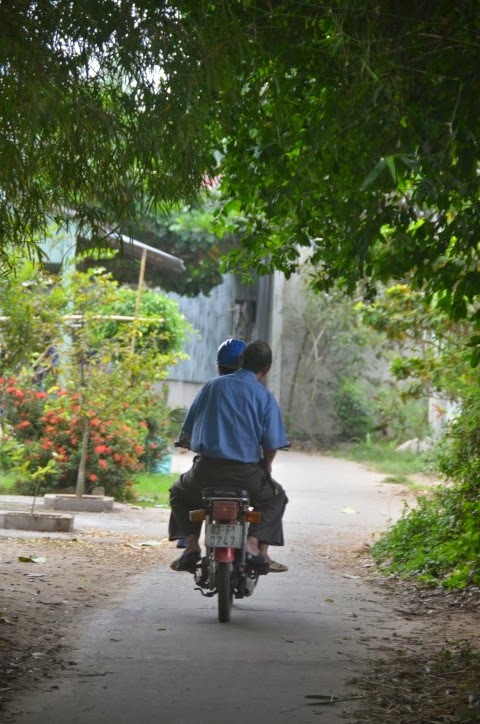 I printed photos for both my uncle and his friend so they will have a bit of this memory to cherish. 1) Marinade the duck pieces with fermented tofu, lemongrass, shallots and garlic. 2) While the duck is being marinaded fry the taro pieces in a little oil until golden brown. 3) Fry the duck pieces (except for the liver) until they are lightly brown. 4) Pour the coconut water over the duck pieces and cook until just boiling. Cover the pot partially and turn heat to a simmer. Cook for about 1 1 /2 hour or until the duck is tender to your preference. Remove and discard any of the scum that floats to the top. 5) Add the browned taro pieces and liver. Cook for about 5-10 minutes until the taro is somewhat tender. Season with sugar to taste. 6) Transfer to a hot pot. Add vegetables as you eat. Dip the cooked vegetables, meat and taro in the sauce if interested. *You can add different types of mushrooms and other vegetables if interested. I think my aunt bought so many vegetables that was enough to fill 6 of the one-gallon bags. *If you like more taro then use more. *The coconut water was very tasty and sweet so I did not need to add much sugar for this hot pot. As usual I recommend adjusting the ingredients to your taste. *Make sure the fermented tofu is tasty. I was lucky to find a good one when I was in Soctrang. Luckily I got the name of the store that carries this particular one. In the States you can ask the store clerks or owner for the best type of fermented tofu. For such item I prefer to shop in small Asian grocer so I can easily talk to the owner myself for his/her suggestions on which one to buy. 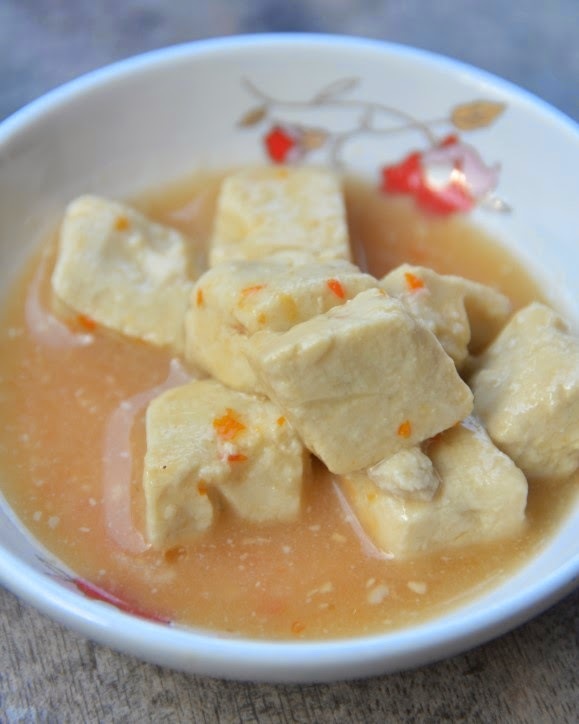 You will see there are many types of tofu and not all of them will make a good hot pot. My mother tells me she prefers to buy the fermented tofu from Taiwan. Stir all ingredients together and cook for about 5 minutes. Add chopped chili pepper if interested. *This sauce is liquid form. My cousin Hui Chieu makes her sauce using just the fermented tofu, lime juice, sugar, and hot chili pepper; this is a much thicker sauce. *Most Vietnamese chop the duck with bones and all into about 2-inch pieces. I prefer to remove it by separating the joints. I only chop through the bones only if needed. I find my method will have less bone fragments. Enjoying hot pot with some of my relatives. 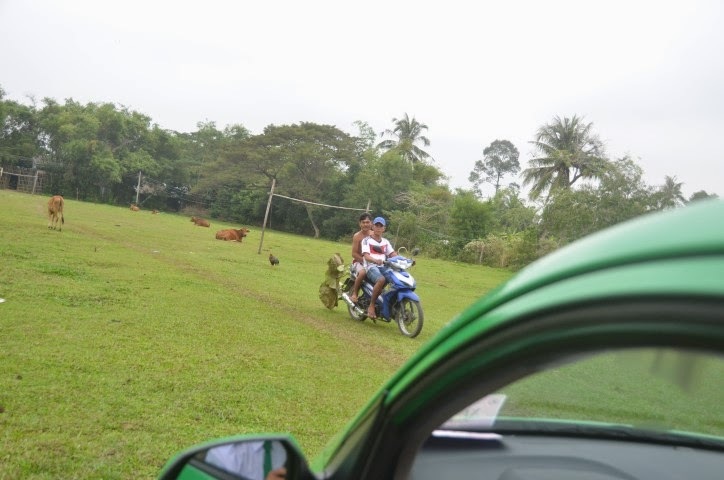 My first exciting taxi ride through a cow pasture (aka soccer field)! since it was not accessible by taxi. others I did not know since I was not present to witness them. You see 2 frail looking men in this photo. powerful positions and were highly respected. 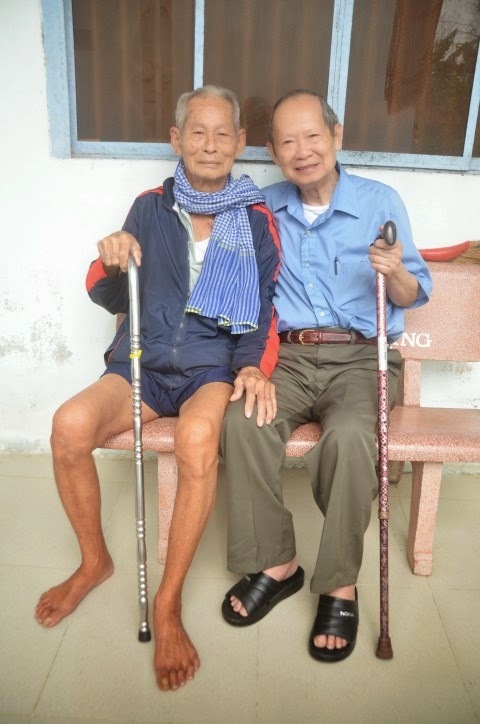 Thank you Thanh for sharing your vit chao recipe and your uncle's story. Funny thing is the first time I ate vit chao was when my roommate cooked it and we were living in Lowell MA. Ever since the first time eating vit chao, I wanted to learn how to cook it myself. I have a question regarding marinating the vit in step# 1, how long do you recommend at a minimum to marinate the vit with fermented tofu, lemongrass, shallots and garlic? Thank you for visiting my blog. Sorry for the delay in my response. I would say the minimum would be 20-30 minutes.